It's quick, easy and very yummy! 1. Mix chicken, cream of mushroom soup, and milk in saucepan over medium heat until hot. 2. Cook rice according to directions on package. 3. Stack it up...We like to start with rice then layer on the chicken mixture. 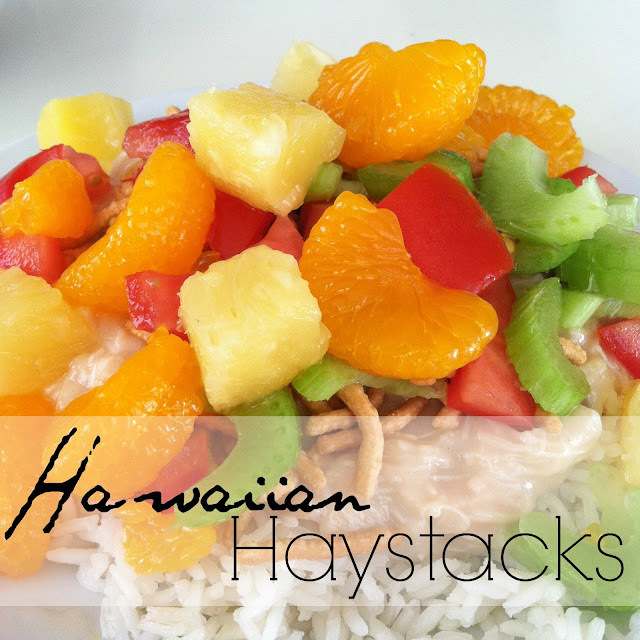 Top with cheese, chow mein noodles, chopped celery, tomatoes, mandarin oranges and pineapple chunks to taste. This meal is so simple and tasty, it's perfect for a busy night! I hope it becomes one of your family's summer favorites too! The winner of the Minted Giveaway is Paige Byrd of Lively Green Décor! The winner of the Procter & Gambel/Home Depot Giveaway is Laura from Three Times a Mom! Drop me a line ladies and we'll get you set up with your prizes! My husband's family makes a very similar dish that they call "Stacky Upy". I thought it was the strangest (admittedly gross before I tried it) dish, but now I love it as much as they do. They make the rice and put each topping (bananas, kiwi, chow mein noodles, peppers, etc.) in dishes to do buffet style. Yum!